Neuroimaging examinations (CT or MR) are often performed for diagnosing dementia. Films are usually evaluated by qualitative visual inspection. Nonetheless, the added value of neuroimaging in the dementia workup is unclear, and studies of its cost-effectiveness are lacking. An official document issued by the American Academy of Neurology, based on the revision of over 1800 research studies, concluded that CT and MR should be regarded as “options” in the diagnosis of dementia, ie, they can be considered in “certain clinical situations” (1). Lumbar puncture and EEG shared the same rating of recommendation. Furthermore, in a specialized setting it has been shown recently that the diagnostic accuracy of dementia was improved to a small degree (5–10%) by laboratory examinations and qualitative assessment of CT and MR (2). Given the comparable increase of accuracy and the significantly different cost of the two kinds of examinations, the analysis casts a shadow of doubt on the cost-effectiveness of neuroradiologic evaluation of dementia. We wish to describe a patient in whom neuroimaging of brain atrophy added important clinical information to clinical and laboratory examinations. A 76-year-old woman was referred to our Alzheimer's unit with a history of forgetfulness. The patient was otherwise in good health. Memory loss began 2 years earlier, and progressed to disorientation and disability in daily activities (eg, taking medication, shopping, cooking, doing laundry). 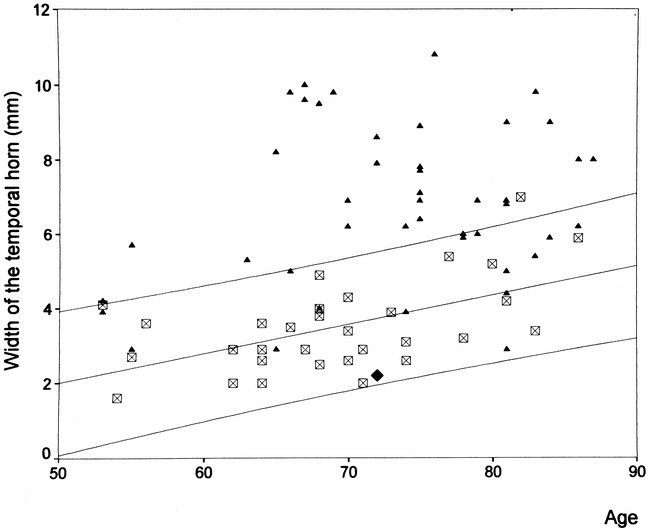 Her Mini-Mental State Examination, a measure of cognitive performance, was 23/30 (normal values are above 24). Neurologic examination showed no signs of a focal lesion. The CT scan was normal. Blood studies were all normal including free T3 and T4, but her thyrotropin (TSH) levels were in the high range of normal (4.42 μIU/L; normal values: 0.5–5.0 μIU/L). Her neuropsychological pattern of impairment was consistent with Alzheimer's disease (poor ability in copying figures, poor recent episodic memory, preserved autobiographical memory, poor judgment). The patient was given a diagnosis of probable Alzheimer's disease according to current clinical criteria (eg, standards of Alzheimer's Disease and Related Disorders Association), and was entered into an ongoing study aimed at the quantification of brain atrophy with simple linear indices taken from conventional MR examinations (3). When our patient was compared to probable Alzheimer's patients and control subjects, it became obvious that she had medial temporal lobe atrophy indices well in the control range (Fig). The high sensitivity of the patient's medial temporal lobe atrophy on MR images prompted us to reconsider the case, and the patient was contacted for follow-up 12 months after initial MR imaging. The graph above depicts the range of medial temporal lobe atrophy (width of the temporal horn) in our patient (diamond), 45 Alzheimer's patients (triangles), and 31 controls (squares). The regression line and 95% confidence intervals for controls are shown. The patient's cognition and daily function had further declined. Her Mini-Mental State score was 18/30, and most of her neuropsychological functions had significantly deteriorated. TSH levels were clearly elevated (6.45 μIU/L), although thyroid hormones were again normal. This condition is known as subclinical hypothyroidism because symptoms of hypothyroidism are usually absent, but associated cognitive deterioration has been reported (4). A serum antithyroid antibody was administered in our patient, indicating an autoimmune thyroid disorder. Replacement therapy with levothyroxine was started at 25–100 μg daily. The patient was seen yearly for the following 3 years, and her Mini-Mental State Score rose to 22, 26, and 27. Her disability was alleviated gradually. The final diagnosis was dementia arising from hypothyroidism. On her last examination, neuropsychological tests were all within normal limits, daily function had fully recovered, and the patient complained only of mild subjective memory disturbance. The cost-effectiveness of medical testing is receiving increased attention in the clinical literature (5), and the favorable cost-effectiveness of neuroradiologic procedures in some clinical conditions has been shown recently in adolescent psychosis, hearing loss, and in patients with equivocal neurologic symptoms. Despite their widespread use, the cost-effectiveness of neuroimaging examinations of dementia has, to our knowledge, never been demonstrated. Although it is obviously impossible to generalize our observation in this single patient, we believe that the case exemplifies how, in routine dementia assessment, the additional information conferred by neuroimaging can add significantly to patient workup. In our patient, the quantification of atrophy by MR imaging did indeed provide crucial information that other investigations had failed to provide, leading to a radical change in treatment and prognosis. We believe that researchers in this field should place more emphasis on the evaluation of how much more information neuroimaging can give in addition to clinical and laboratory examinations. Such data are crucial for demonstrating the cost-effectiveness of neuroimaging procedures in the diagnosis and treatment of dementia.